1. First you need to prepare your supplies. Paint each egg carton section brown. Trace around the end of the paper tube and cut out 4 brown paper circles. Cut ⅓ off one of the tp rolls (the smaller tube will be the reindeer's head). Paint the paper tubes. 2. 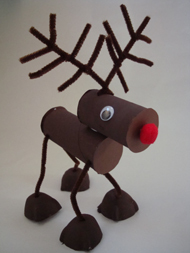 To make the reindeer's legs insert a pin in the bottom of the biggest paper tube. Poke four holes where the legs will be, two at the front and two at the back. Insert the tip of a pencil into each hole to make the holes just a little bit bigger. 3. Use the pin to poke a hole into the top of each egg carton section. Insert the end of the pencil again to make the hole just a little bit bigger. 4. Cut 3 of your pipe cleaners in half. Insert one pipe cleaner into one of the holes in the paper tube. Pull the pipe cleaner at least 1" into the tube and twist and curl it so that it is secure. 5. Insert the other end of the pipe cleaner into the hole in the egg carton section. Pull it through at least 1" and twist and curl it so that it's secure. Repeat steps 4 and 5 for the other 3 legs. 6. Put some glue on both ends of the tube and glue a paper circle onto each end. You've finished the reindeer's body. 7. The smaller paper tube is the reindeer's head. Make the antlers the same way as you made the legs. Poke two holes in the top of the paper tube, insert the pencil, and thread a piece of pipe cleaner through each hole. Twist and curl the pipe cleaners on the inside of the paper tube to secure. 8. Twist the two pipe cleaners together at the top of the paper tube. 9. Take your last pipe cleaner and cut it into small sections. Twist pieces around the long pipe cleaner antlers. 10. Glue the last two paper circles onto each end of the reindeer's head. Glue on your google eyes and your red nose. Lastly, glue the head onto the body. You can adjust the height of your reindeer by pulling the pipe cleaners through his hooves. Bend your reindeer's pipe cleaner legs to make him stand up all by himself!